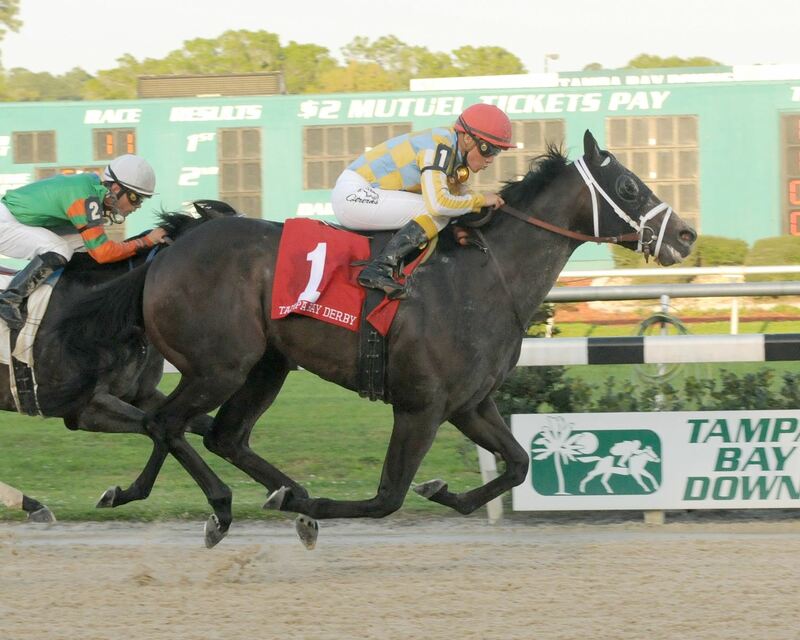 What have you missed on Thoroughblog? Clock on the recent posts and check it out – from breaking news at HASTINGS PARK, to the current lists of Favourite books I have read recently and top Queen’s Plate contenders. TODAY’S NEWS – Equipment changes are so important in racing when you are trying to bet on a race, sometimes they make a big difference. Yesterday it was blinkers on for PROSPECTIVE and 2 starts ago for 35 to 1 Dubai winner MIKHAIL GLINKA, a stablemate of Canadian colt MARITIMER. Hey maybe Woodbine’s top trainer and jock will be going to the KENTUCKY DERBY!? Kentucky bred PROSPECTIVE could take Woodbine’s leading trainer MARK CASSE to the Kentucky Derby after the son of popular sire Malibu Moon won the Tampa Bay Derby yesterday by 3/4 of a length. The time of 143.33 for 1 1/16 miles was good for an 88 Beyer Figure, the best of the colt’s career. Owned by John Oxley, who recently joined forces with Casse to buys expensive young horses and make an assault on bog races in Canada and the US, Prospective was pumped up early in the ‘Derby with his new blinkers on. He bulled his way into a 2 horse duel before the 1/4 pole, led and then had to hold off an inside big by newcomer Golden Ticket. If Mark Casse had any doubts about Prospective fighting off Golden Ticket through the stretch run of the Grade II, $350,000 Tampa Bay Derby on Saturday, his 3-year-old colt did an awesome job dispelling them. Headed by Golden Ticket with a furlong to run, Prospective surged again under jockey Luis Contreras to post a ¾-length victory in 1:43.35 for the mile-and-a-sixteenth at Tampa Bay Downs, the second-fastest time in the race’s 32-year history. The only faster winning time was by Street Sense (1:43.11) in 2007. Wearing blinkers for the first time, Prospective moved smoothly between Fox Rules and Spring Hill Farm approaching the final turn, overtook pace setter Cajun Charlie with ease and appeared as if he might cruise to victory. But Golden Ticket, who broke his maiden in his previous outing at Gulfstream, cut the corner smoothly under jockey Manoel Cruz to make it a battle royale to the finish. Prospective paid $8.20 to win as the third betting choice in the 11-horse field. Cozzetti ralled nicely to finish third by a ¾-length margin from the 11-5 favorite, Spring Hill Farm. Grade III Sam F. Davis Stakes winner Battle Hardened was sixth. The Tampa Bay Derby was able to live up to its considerable billing, especially with Prospective looking so strong virtually every step of the way. “He (Prospective) moved a little earlier than I expected, but I just tried to keep him quiet and save as much horse as I could for the stretch,” Contreras said. “The inside post really helped me a lot because I saved ground into the first turn. “The pace was much faster than in the Sam F. Davis (in which Prospective finished second to Battle Hardened) and the blinkers seemed to make him more aggressive. Man, did he want to run today,” Contreras said. “But he let me keep him in hand when there was an opening between horses making the far turn. I asked him again entering the stretch and I thought we had it won, but then (Golden Ticket) came up inside us and he had to respond again. Prospective, a Kentucky-bred son of Malibu Moon-Spirited Away, by Awesome Again, is owned by John C. Oxley, who underwent hip surgery recently and was unable to attend the Tampa Bay Derby in person. Casse said Prospective was a different, more mature horse than in the Davis. Now 4-for-7 lifetime, he made his victorious 2012 debut Jan. 14 at Tampa Bay Downs in the Pasco Stakes at seven furlongs. “I was shocked he made the lead so early today, but with the blinkers he was much more aggressive,” Casse said. “He’s a character—he just does what he has to do. “We put blinkers on to get him to focus a little more. When we watched him in the Sam F. Davis, he was running down the backside the entire way with his head cocked and he was kind of looking at things. Luis said about the 3/8-mile pole of the Davis he thought he was finished, but then when the horse came outside him he started running again. I said to Mr. Oxley, this (the blinkers) will get him a little closer in the early running and it worked,” Casse said. Did you get a chance to see the races from Dubai yesterday morning? A card of events that provided some prep events for horses for the March 31 World Cup night included some solid performances. The MAKTOUM CHALLENGE went to a previously unheralded fellow, CAPPONI, who was 6 for 12 going into the Group 1 race at 10 furlongs. But the 5yo horse tracks a slow pace, got an early jump on the field and held on to win a trip to the World Cup. Interestingly, he had won 2 of his last 3 races but was disqualified from one recently due to a positives test due to a rubbing linament. How about MIKHAIL GLINKA (IRE) winning the CITY OF GOLD at 1 1/2 miles, a prep for the Sheema Classic? This guy, owned by the same owner as Canadian-bred MARITIMER, Ramsamzn Kadryov, had not win since 2010 but had come to life last time with blinkers on. The ‘visor’ which was not reported in any past performanes, has focused this son of Galileo. Yesterday he led all the way to win the Group 1 for trainer Herman Brown, who also trains Maritimer. Mikhail Glinka was 13th in last year’s Canadian International. REGALLY READY, a Grade 1 winner at Woodbine last year, was eased up in 13th in a turf sprint earlier on the card and certainly that audition for the Golden Shanee on World Cup day is not promising. ROCKET TWENTYONE finished last in the Grade 3 Honeybee Stakes at Oaklawn yesterday, beaten 28+ lengths and perhaps we will see this gal regroup and come to Canada for some shorter, Canadian-bred events. Promising Earle Mack 3yo gelding CANADIAN NAVY had an easy 4 furlong workout in Florida yesterday 50. He is trained by Josie Carroll. Expect to see the Caroll trainee DRAGO’S BEST, a Queen’s Plate eligible, in the shorter Plate preps when the season opens next month. DRAGO’S BEST was NO BID yearling at the CTHS Ontario sale. He is by former ONtario sire SEEKING THE BEST, now in Venezuela. MIDWAY, Ky. — It’s only 13 miles from the state Capitol to Alfred Nuckols’ small Hurstland Farm at the western edge of Midway, but in one very important way the two places are very far apart. For more than a century, “wagering” to horse farmers like Nuckols has meant pari-mutuel betting on races, the flow of money that kept horse breeding a major business in Kentucky after the automobile era began. Bets fund race purses, and purses are the fundamental basis for horses’ value. Now, small breeders and boarders like Nuckols say “wagering” has to mean more — slot machines and table games at casinos — to keep them afloat, so Kentucky can compete with other states that boost purses and breeders’ awards with casino proceeds. But even though horses generate more money than any other agricultural product in Kentucky, the General Assembly has again failed to offer voters a constitutional amendment to allow casinos, and that is chasing horses from the state and leaving farmers like Nuckols facing a very uncertain future. Big Red Mike has been back in training for awhile with Nick Gonzales at Gulfstream. He had a work today and is looking to run 2 weeks today at Gulfstream, 1 mile on turf.